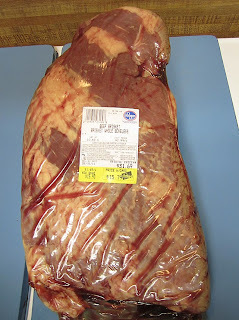 After my wife and Scott sampled my ribs the other night, my Mrs was nice enough to point out that brisket was on sale for half price ($1.49 a pound) and asked if she should pick one up for further experimentation. 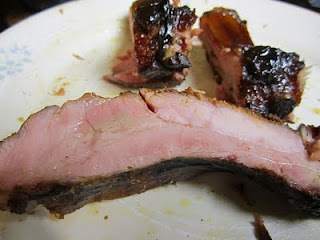 Well after my success with ribs, of course! She came home with a 10.6 pounder, smallish, but a nice size because it would not need cutting to fit in our little bullet smoker. 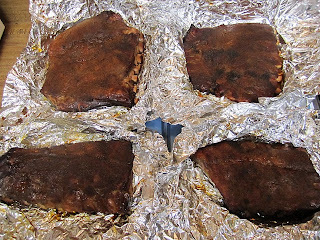 It took me a couple of days to finish off the ribs and I decided to do an overnight smoke starting late Tuesday night. I put the coals on about 11:15 and gave the brisket a good rub down with salt, pepper, a few spices, and my secret liquid. 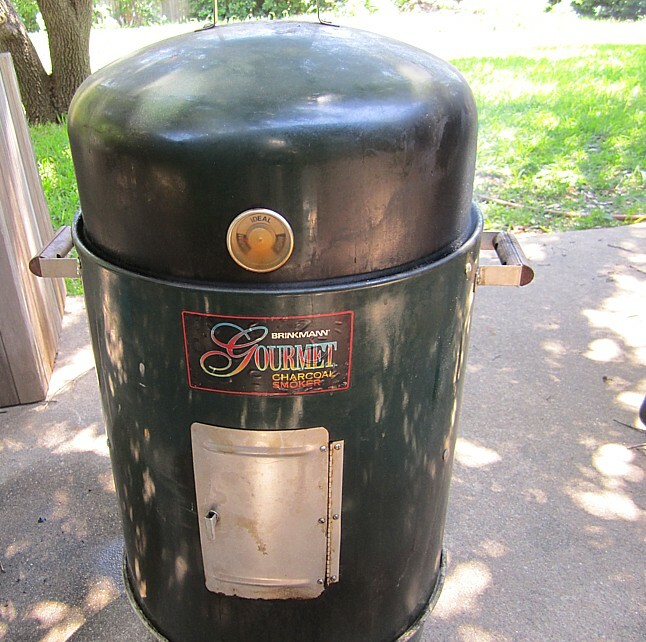 I didn't trim a thing, just rubbed it down and slapped it on the top rack of the smoker. 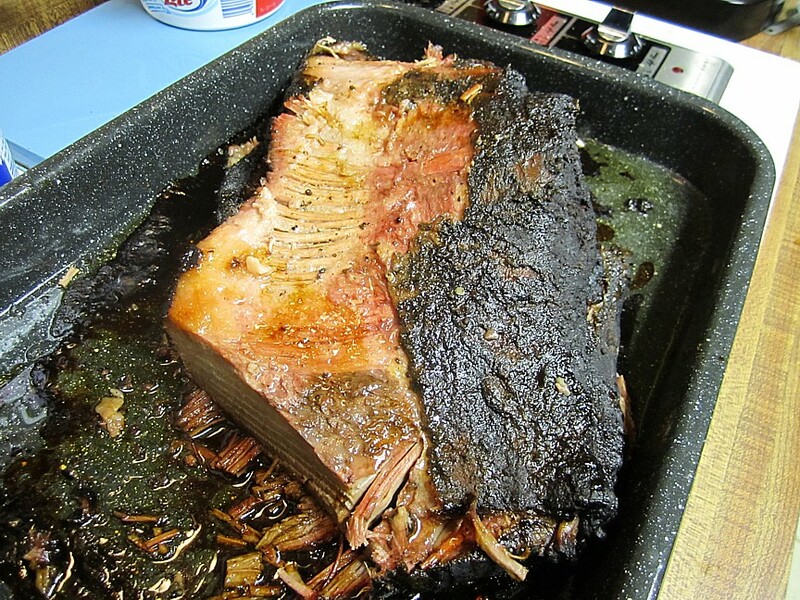 The brisket went on about 11:45 pm, with lots of hickory and pecan wood which had been soaked in water for 24 hours. I added additional wood every hour or so til about 2:30 am when I decided it was time to leave things alone and let the magic happen. I got up about 6:15 am to check on things and found the temperature gauge just on the low side of the ideal range. Perfect timing. Here's the yummy sight that greeted me. Ah yes, that's a great sight to wake up to early in the morning and a sure sign of a great day ahead! Here's what it looked like as I prepped for wrapping. 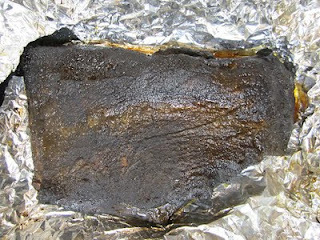 After another liberal salt, pepper and spice application, plus a bit of secret liquid in the foil, I closed everything up tight and slipped it in the 225 oven for another 7 hours. 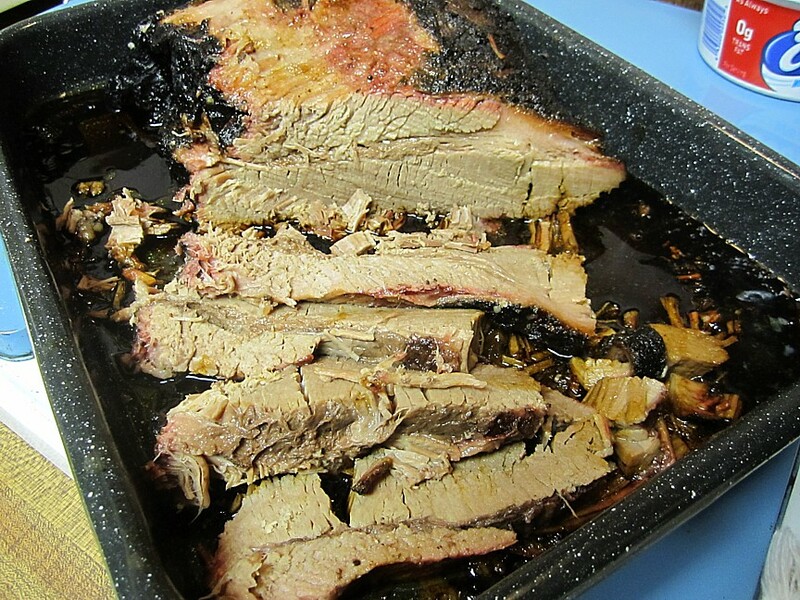 About 1:30 I pulled the brisket from the oven and set it on the stove to rest while a ran some errands. 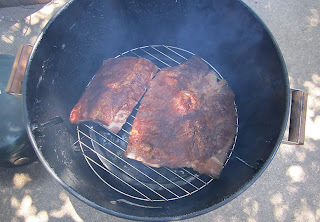 I didn't get back til about 3 pm, but it was still plenty hot and here is the delicious sight I unwrapped. I started slicing at the tip and those delicious smokey bits went away almost as fast as they were sliced. 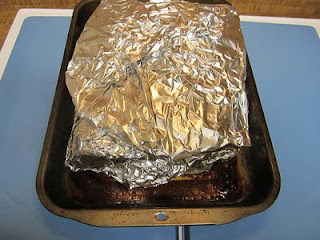 I noticed early on it was a bit too long in the oven as it was difficult to slice except in thicker chunks. I guess if I had to choose, I would rather it be a bit too tender than too chewy. It was close to just right, but just a tad too tender. As I got deeper in it became even more tender and the smoke flavor was definitely less pronounced. However I remedied that by making sure to drizzle lots of pot liquor over the slices. The fat was perfectly rendered and the meat was moist and juicy throughout. I think my wife's brisket usually has a bit more smoke flavor than this one had, but she spends more time tending the fire. 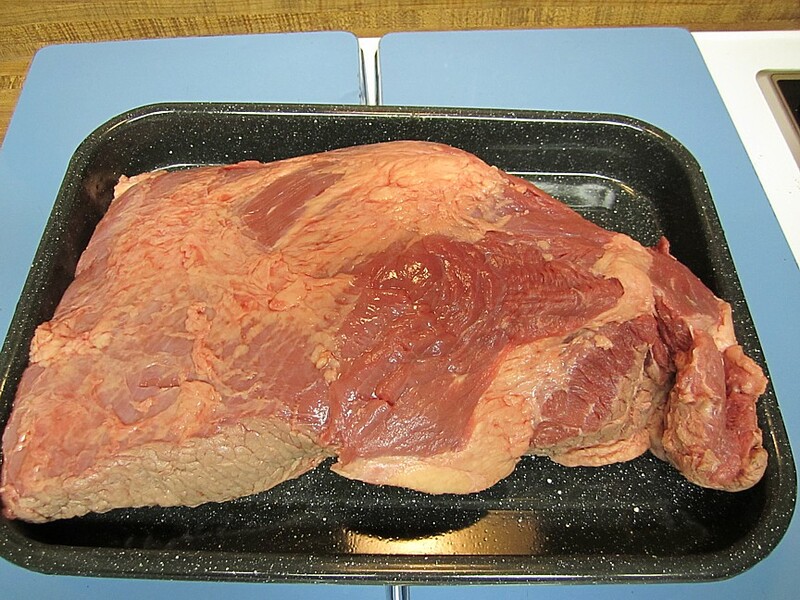 I know we will enjoy this meat over the next few days, even if I do need to add a bit of sauce now and then. A larger brisket, cut in half to fit our little bullet smoker, would cook a bit faster and would provide even more smokey bits. That's still my favorite part, by far! Rib-N ... the verdict is N!! Well that last two hours seemed an eternity but I have been grinning ever since. 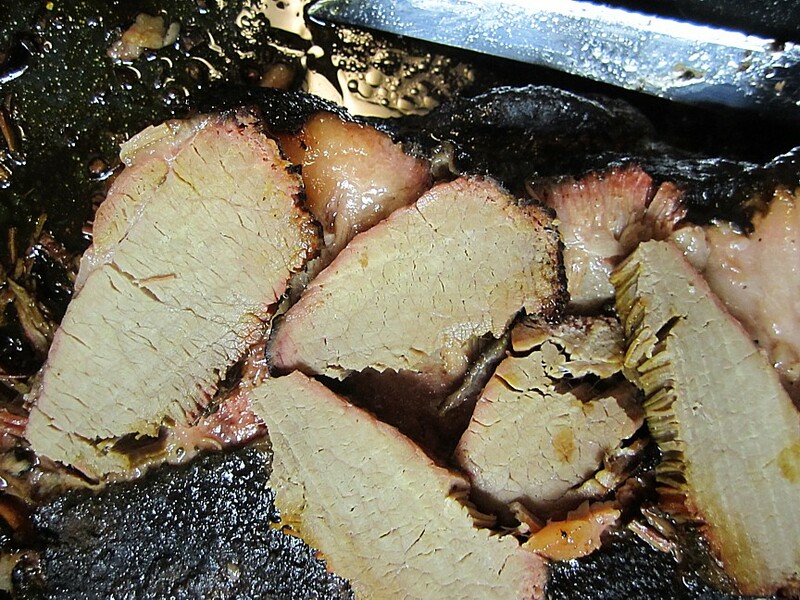 The smell of smoked meat permeated the house long before I was able to sink my teeth in. When the timer finally went off, I was a little disappointed to find a ring of liquid around the base of the pan. 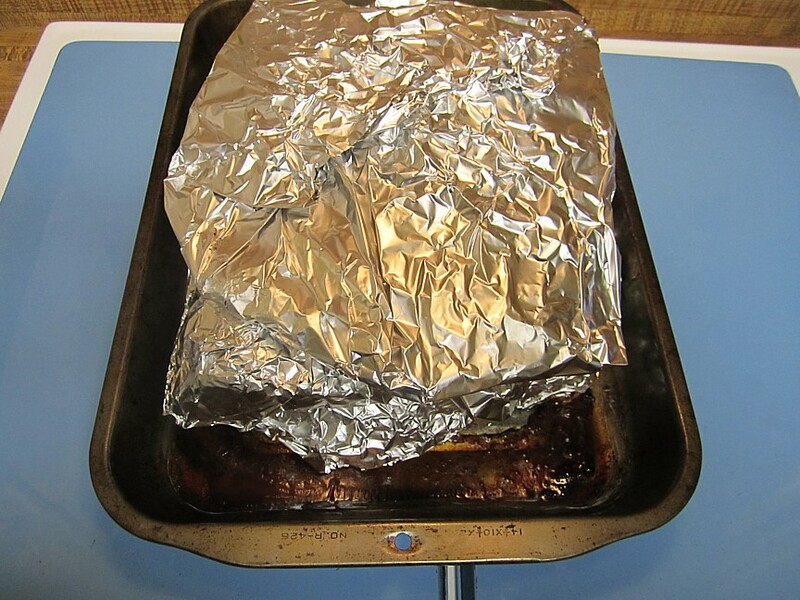 I thought I had the foil closed up tightly, but I guess all those juices just had to find a way out. I was worried about having dried out ribs but there was no problem at all. I unwrapped each package almost like a kid at Christmas with ooohs and aaahs and a little nibble here and there. When I finished, this is what I saw. Be sure to click on that photo above for the bigger version. 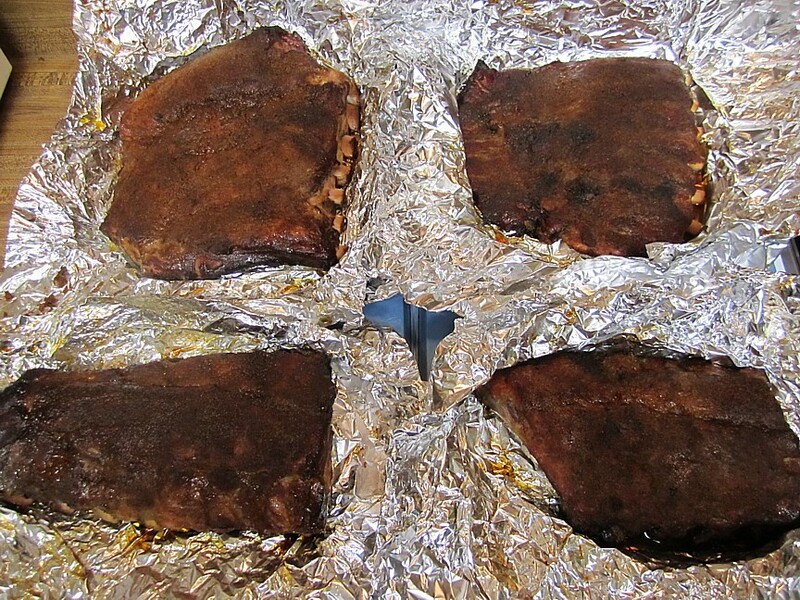 I started slicing right in the middle, wanting to sample a mid-section piece from each half rack. I kept the ribs separate, so I could judge whether the marinade made a difference or not on each type of rib. I found little difference. 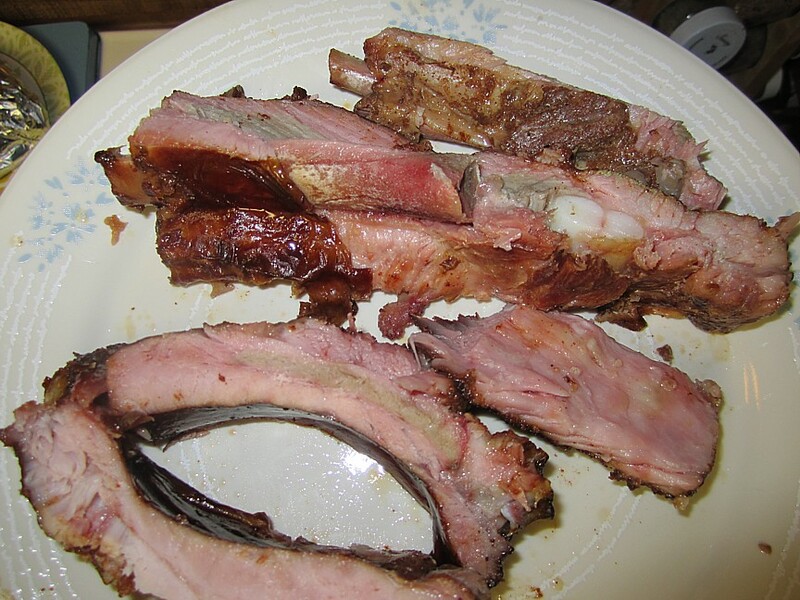 None of the ribs displayed a deep smoke ring, but as discussed previously, that seldom seems to affect the taste. All of these ribs were perfectly tender, moist, the fat was rendered just right, and the dry rub added some nice flavor and a little heat. The one thing that was missing was smoke flavor. 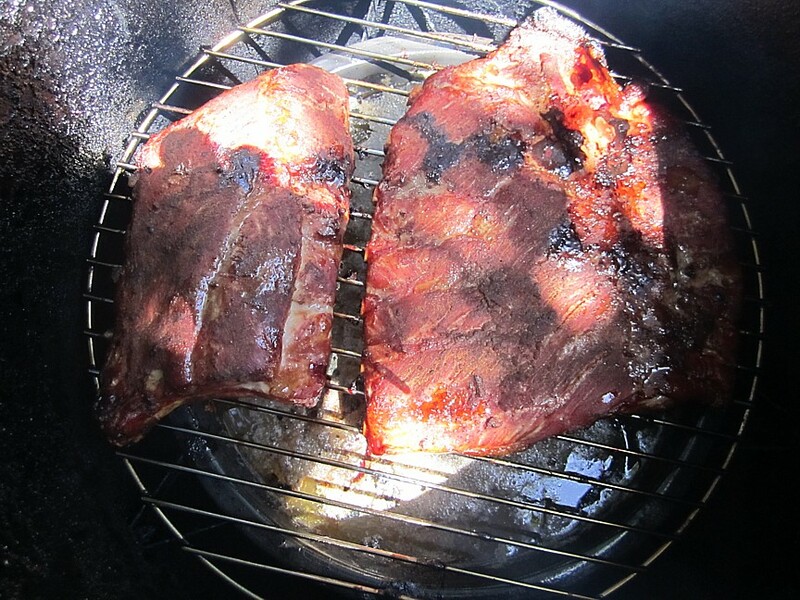 I don't know if I didn't add enough wood or if it needs to stay on the smoker longer than two hours. Probably the former, as my Mrs turns out perfectly smoked chicken in that time. Rookie mistake. 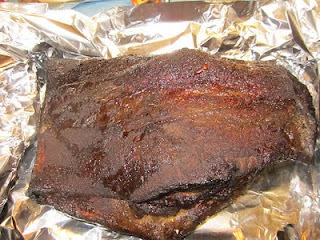 My main concern was in "leaving it be" in the smoker without dropping the cooking temperature below the "ideal" range. 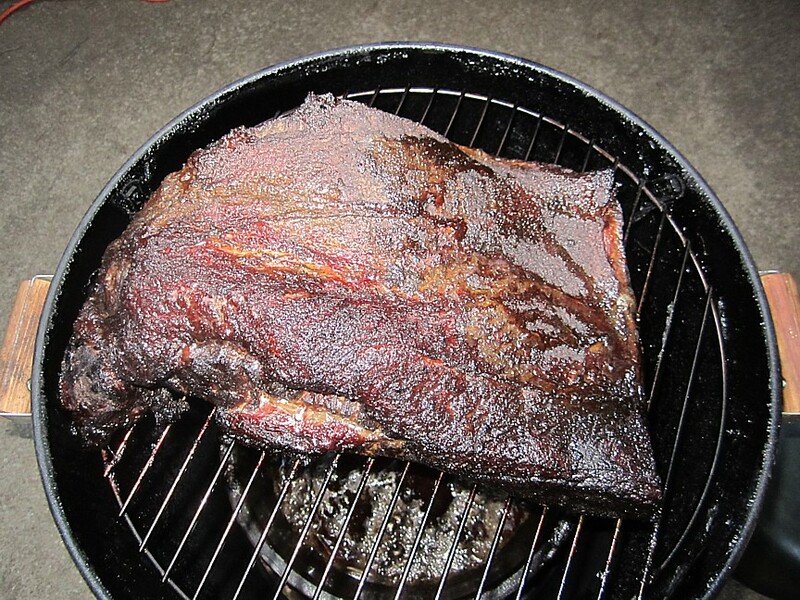 There was plenty of smoke exiting the smoker, but I guess it needs more, for longer. 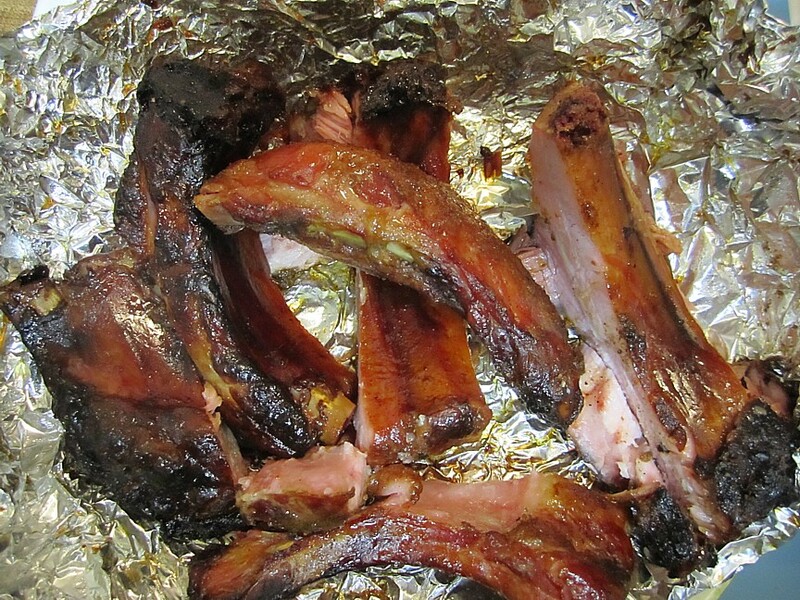 I was really happy to find none of the meat falling off the bone. 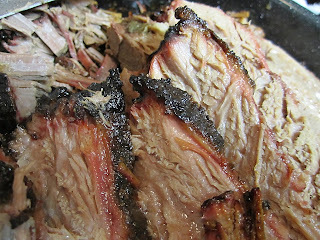 It all held well, yet was tender and left a perfect bite mark. 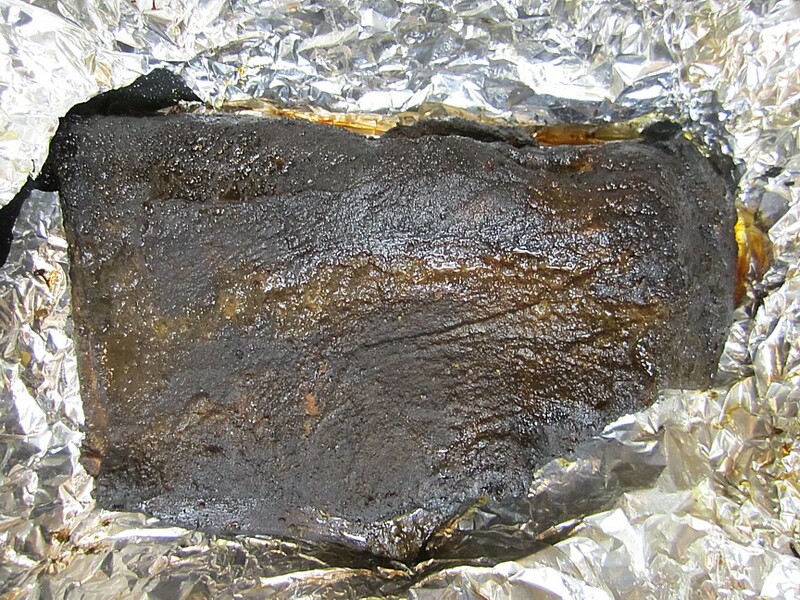 In KCBS scoring these ribs would have done very well on tenderness. 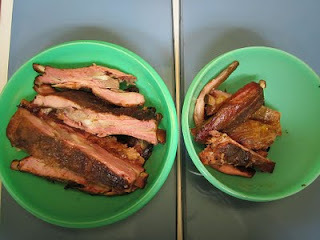 I have to admit I did not find a lot of difference in the baby back versus the spare ribs. 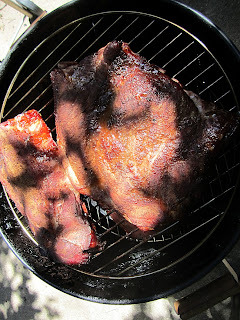 I was concerned with the baby backs being smaller they might cook too much and dry out. Not a problem either on the top or bottom rack. They all came out great. After eating way too much, I chopped up the remainder for leftovers. 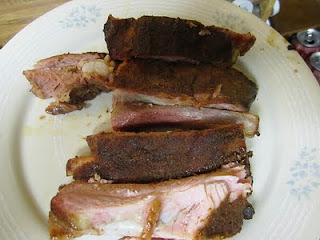 I found years ago that ribs warm up great in the microwave so you can guess what I'll be munching on the next few days. Overall, I think the marinade did not add a thing. 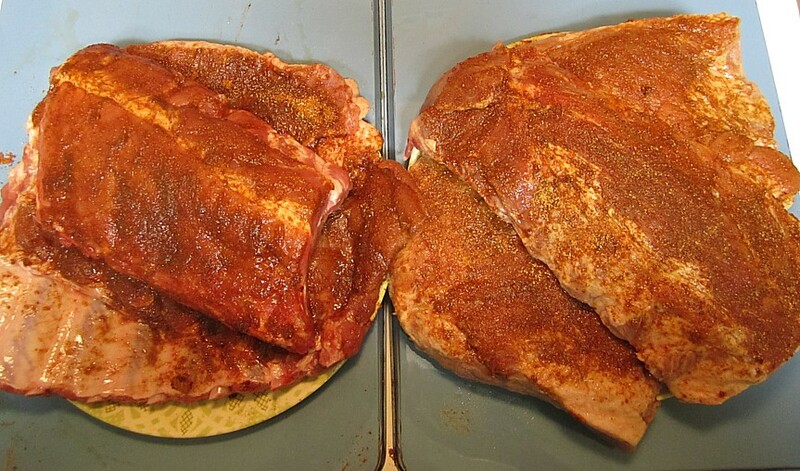 As well as these turned out, I doubt an overnight or longer marinade would help much versus the 3 hours I did today. In fact I kind of find myself wondering, is this all there is to it? I guess I can understand now why I had so many good ribs when judging cook-offs. Maybe it really is that easy. It also makes me wonder why I get so many bad ribs at BBQ joints. Oohh, now for the good part. After 2 hours of smoking it was finally time to take the lid off the smoker. 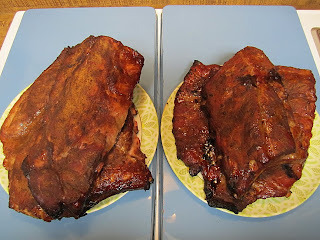 Here's the top rack (marinated). Yes they do look yummy! The next step is the tendering process. 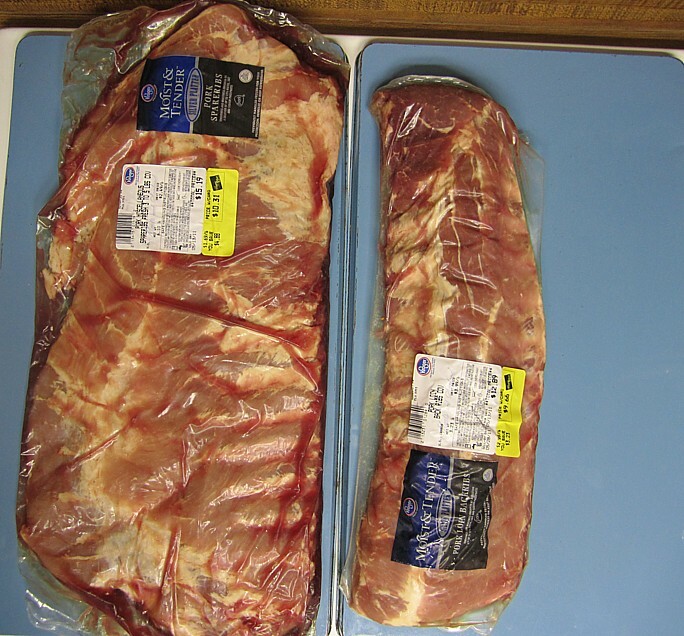 Marinated ribs (top rack) on the left, plain (lower rack) on the right. 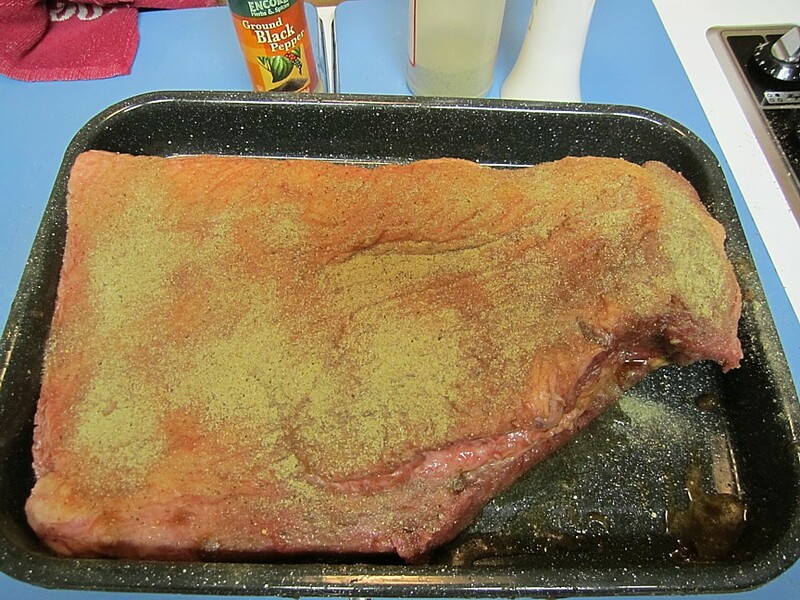 Each half slab was put in its own wrapping of heavy foil and liberally sprinkled with Obie-Cue rubs again. Then a secret liquid was added, NOT apple juice! Then everything was wrapped up tight and into the oven for another two hours at 250. Yes, I did have to sneak a couple of bites and they were delicious, if a bit chewy. Now the hard part, waiting for that ticking clock to tick by for another two hours! I am starting to get hungry!! Alrighty, things are moving along. 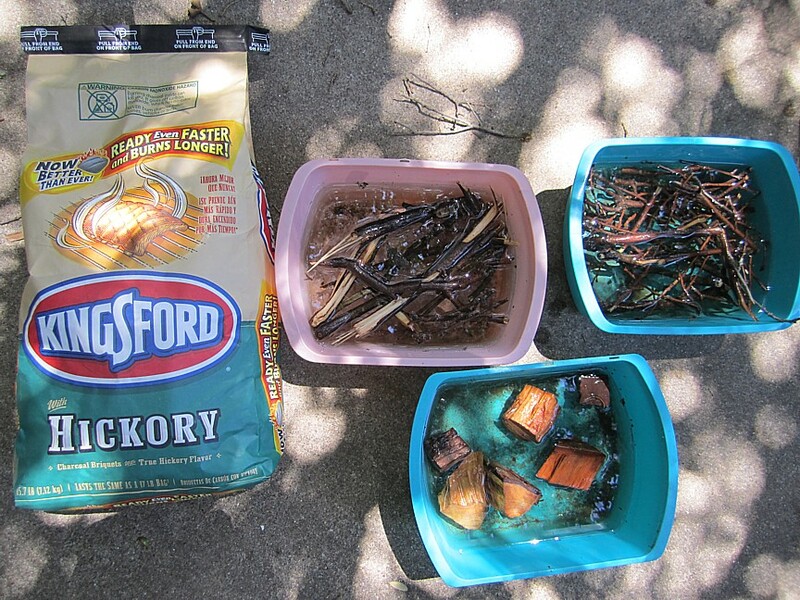 I soaked some yard timber (oak and pecan) and some store bought (hickory) while things were marinating. 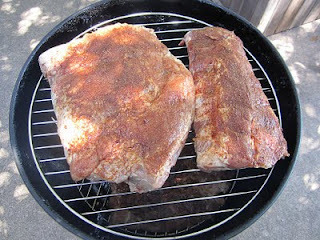 After about a 3 hour soak in the marinade, I coated both sets of ribs with a mix of Obie-Que's Sweet Rub and Obie-Que's Sweet N' Heat. Remember, one set has soaked in marinade, the other has not. 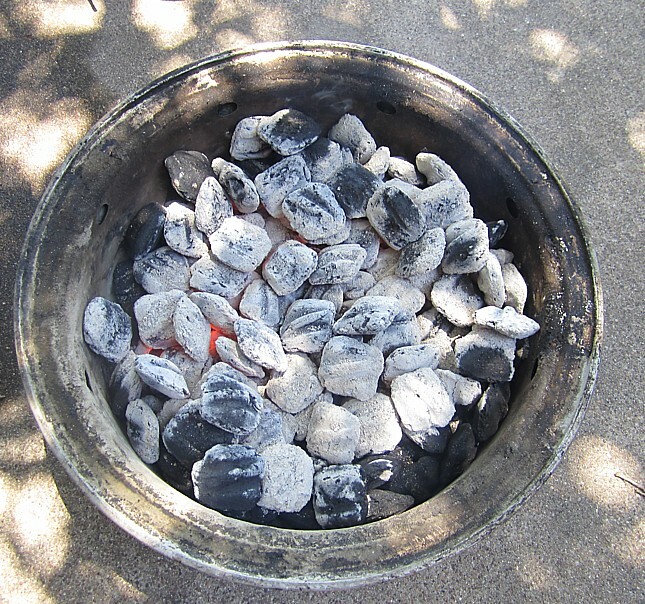 As I waited for the rub to set in, I got the coals going and then set on the smoker to get it heated up. Once I got the rig up to temperature, I put the smaller half-racks on the lower rack and the bigger portions on the top rack.﻿ I added some of the soaked wood, closed her up, and now I just sit back and let it do its thing for the next two hours. My Mrs is busy all day today and Kroger had ribs on sale cheap so I think I will do some experimenting with ribs today. 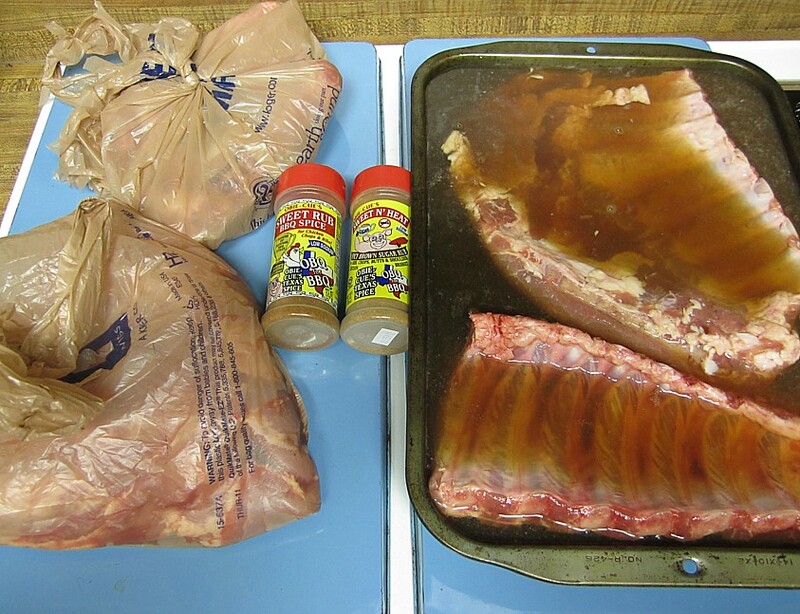 I bought one rack of baby back and one rack of spare ribs and cut each in half for experimentation purposes. Total cost less than $20. I am currently bringing the meat to room temperature, half are plain, half are in a marinade of apple juice and certain secret ingredients. The plan is to use the same Obieque rub on both sets, smoke for 2 hours in a bullet smoker over charcoal with oak, hickory, and pecan wood. 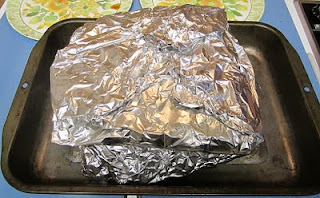 Then wrap and finish in the oven for 2 more hours and see how they turn out. I am NOT a BBQ cook, more of an eater, so I'm not expecting much. I'll post photos and update as I go along, just for fun. I am leaving the membrain on both and the back meat on the spare ribs and will cook them "as is" without trimming a thing.